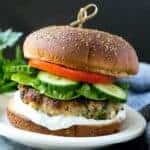 Greek-inspired turkey burgers chock full of spinach, feta, and seasonings. Place the turkey, spinach, feta cheese, salt, pepper, garlic, egg and lemon juice in a large bowl. Mix until well combined and shape into 4 patties. Add the patties to the pan and cook for 5-6 minutes on each side or until cooked through. Serve immediately on white wheat buns topped with lettuce, tomato, cucumber, and tzatziki sauce.